Following on from my last post of “Place your future bets- invest in Innovation Capital” which outlined the significant contribution innovation capital plays in our economic growth, let me offer some further thoughts on its value to really capture and understand, so we can measure it within our organizations. 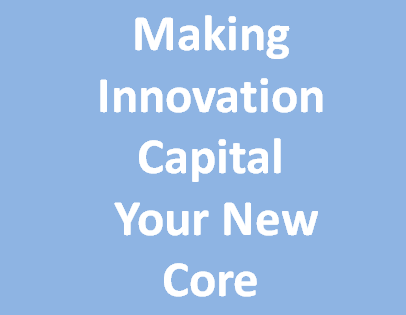 We have the three components; of physical capital, knowledge capital and human capital that are the innovation-related assets, these make-up Innovation Capital. Innovation capital needs assessing and measuring so we can understand the relationship between this innovation capitals (and its present and future potential) and organization performance. We need to know the innovation capital ‘stock’. Why, well ‘stock’ can be ‘static’ and we need to make this more ‘dynamic’ so innovation can ‘flow’ from this constant renewing of our capitals and be transformed into new value. Recognizing the value of our innovation-related assets is where the ‘smart money’ should go. To gain growth and to improve productivity is through innovation. We need to translate knowledge into new values. 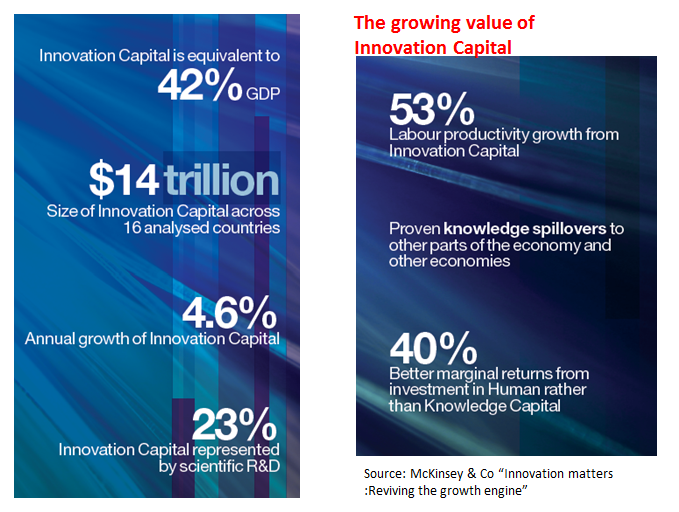 When you pause and consider the make-up of Innovation Capital you realize it makes such an economic contribution and in a report from McKinsey & Co, they have set about identifying this to produce the above summary, covering 16 countries, to understand the real value of this Innovation Capital. These numbers are big and still don’t fully capture everything associated with innovation as much remains ‘hidden’ or ‘attached’ to other activities as well. Most rooms we enter have four sides; they provide the structure to build upon. 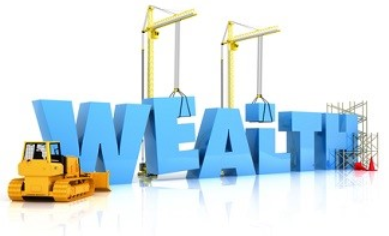 Presently in many of our economies, particularly in the West, we are struggling to find real growth; we are limited on our wealth-creating possibilities. Why is that? Our structures seem to be weak not strong. We are certainly relying far too much on ‘selected’ pockets of economic activity to keep us going. Technology is clearly one of these. Yet our longer term forces for sustaining growth remain ‘fragile’, our structures remain wickedly ‘out of kilter’ and we need to find stronger connecting frameworks that reinforce each other, so we can build further upon these to manage our business activities in new ways. In most of our economic activities technology is playing a significant part in altering our habits, routines and thinking but it alone, is not enough. For technology to really give benefit it needs to be driven by our ability to generate wealth creating activity and that comes from integrating knowledge, gaining experience and being able to articulate this in better ways. To achieve this, our business structures that we have in the past relied upon are in need of changing. They need different pillars to build upon.